What does the Blake Society think it’s doing by advertising in their July newsletter the mansion that one of the Trustees of the Blake Cottage Trust, Peter Johns, has just put on sale? The piece taken from the MailOnline is not an item offering any information that might be of interest to Blake followers: its sole purpose is to advertise the sale of the house, as its heading makes quite clear: “Your chance to own England’s green and pleasant land: House that inspired William Blake to write Jerusalem goes on sale for £900,000“. It is not only the bad taste of the whole thing (England’s green and pleasant land is not owned, even though the three members of the Blake Cottage Trust seem to believe they somehow do by having stolen Blake’s Cottage. Maybe that is why they, and the Blake Society Trustees, feel happy with the vulgarity of the language). And, Mr John’s house didn’t inspire Blake to write Jerusalem, so they might as well get their facts right. 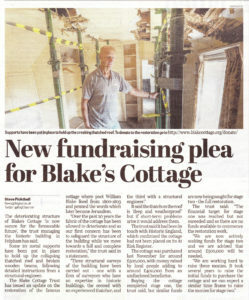 In any case, and given the mess that both the Blake Society and the Blake Cottage Trust have made around Blake’s Cottage, including their muddled finances, this seems to be, apart from distasteful, a worrying turn of events. I wonder how far they think they can go in mixing the affairs of their private wealth with their duties as Charities, and just how far they think they can appropriate the space, work and fruits of the Charities they are supposed to serve through this bewildering practice. The Blake Society even points the reader, in their newsletter, to the property agency in charge of selling Mr John’s house! Is that what the Blake Society and the Blake Cottage Trust have become now? Property speculators? They should know better. Though the Blake Society has removed me from their newsletter list, without even warning me they were planning to do so, they can’t really hide so easily.